Have you tried making T-shirt yarn yet? It's actually more simple than you would think and you can make all kinds of cute and useful stuff for your home with it. Like hot-pads! Notes: This pattern makes a hotpad that measures approx. 6 3/4 in x 8 1/4 in. 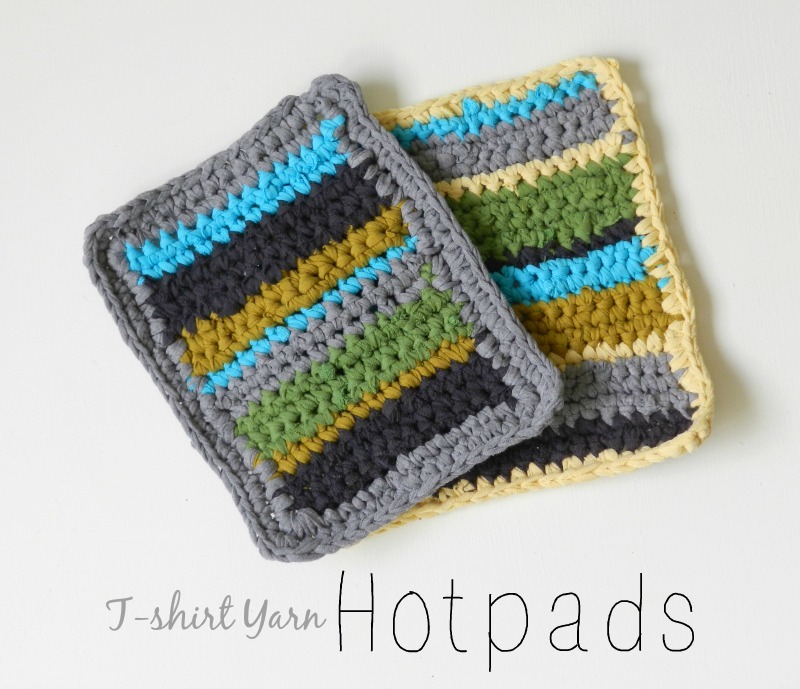 To make a larger or smaller hotpad, increase or decrease the beginning ch, or use a larger or smaller crochet hook. Row 1: Sc in 2nd ch from hook. Sc in each ch across. Turn. Row 18: Ch 1, sc in each sc across. At the end of this row, add yarn for the edging. Row 1: 3 sc in same sc as join, sc in each space along each side of the hotpad, making sure to 3 sc in each corner. Row 2: 3 sc in first sc in the corner, sc in each space along each side of the hotpad, making sure to 3 sc in each corner. Fasten off and weave in ends. Okay these are so cute! I have never heard of t-shirt yarn, but I just clicked over to the tutorial you linked to and I am SO excited to make some!! What a great way to reuse them - I wish I'd known about this idea when I cut all the motifs off my t-shirts and made them into a blanket, because I could have used the bottom portions to make yarn. At least I'll be able to do it in the future. Thanks so much for sharing! I'm glad you learned something from my blog Lisa! Yes, t-shirt yarn is awesome. I don't throw away any old t-s anymore! Love these hot pads! What a great way to re-use t-shirts too! Thanks so much for sharing this at my Creative Ways Link Party! Have a great weekend! Love these! 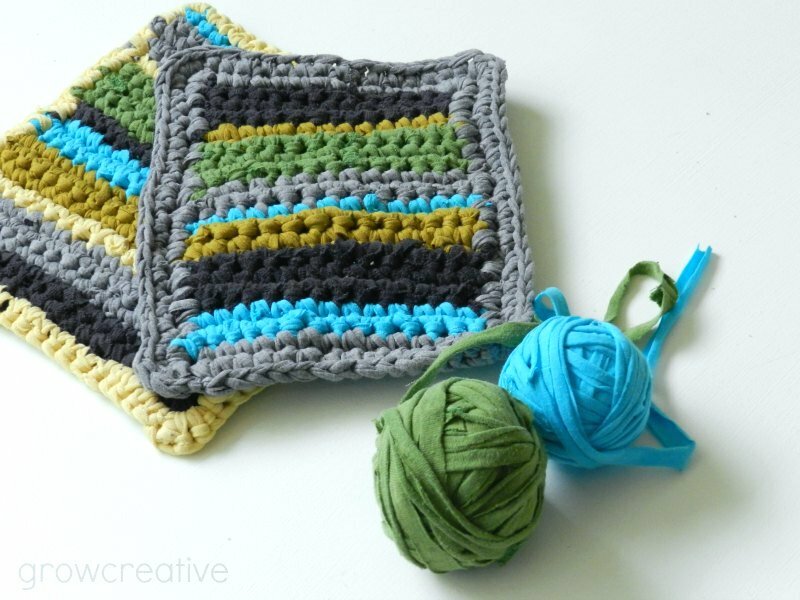 Have been wanting to make these and placemats. . Never heard of tshirt yarn either! ooooh, placemats! Awesome idea! Thanks!